process.” Reality Realty participates in events like the National American Veterans Ball, Armed Forces Expos, National Night Out Law Enforcement program, and local events like the Potomac Nationals’ Military Appreciation Night. All of this volunteer work in the community gets Sam and his team in front of hundreds of thousands of people a year. RESULTS Sam’s “Caremenship™” philosophy, Reality Check™ process and his unique training plan all serve to help his agents assist clients in answering his industry changing question, “How will this real estate transaction help achieve your family’s goals?” “Helping to answer this question and tailoring all efforts around achieving clients’ goals ensures their safety, security, and ability to sustain their quality of life. It also allows for maximum flexibility for when life happens and adjustments are needed.” When selling, Sam’s clients are better able to action the next chapters of their life with confidence knowing they have an integrated plan for their next real estate acquisition firmly rooted in their established time line, life plan and their fiscal well-being. When selling a home, Sam’s team has a professional videographer create video home tours. The videographer uses drones to capture aerial footage of the home and surrounding area. “We put our money where our mouth is, ensuring our client’s home is thoroughly showcased and presented in its most positive light. We then upload this footage to all MRIS sites, third party sites such as Zillow, the national Fine Portfolio Magazine, and we even pay to put it on international marketing platforms to reach potential clients overseas.” Sam explains. “We’re doing it right!” exclaims Sam. “My elite team of 12 of highly-qualified Caremenship™ trained agents enjoy a 95% rate of repeat and referral clients. When you are selling a family a home for the 3rd or 4th time, you know you’re doing it right” Sam said. “Focusing on the clients ‘why’ versus the ‘how to buy’ is so refreshing for our clients that love to pay it forward.” Helping clients to gain clarity on their true purpose of buying a home is a philosophical departure from the usual real estate focus on marketing and selling, but it works well for Sam and his agents, who believe if you put your purpose first, quality sales will follow. retired, reserve, or volunteer military; law enforcement; firefighters; EMS first responders; nurses; educators; and clergy. “We relied on these national and community servants to protect us, keep us healthy and enrich our souls. Ensuring they understand what it means to buy a home from a stability and financial perspective is the least we can do for them. The last thing I want is a community hero taking on extra risk to pay a bill. We need our community heroes focused on soothing our souls and making us whole.” Sam said. Additionally, Sam’s team donates a percentage of their profits to sponsor dozens of local athletic teams, coaches, community hero fundraisers, and numerous charities to sow seeds in his community. “The money part is easy, the time people put into our community and youth is priceless,” Sam said. In his free time, Sam loves to fish, boat, hike, travel and serve his community! Professionally, he remains committed to his vision: “To change the way real estate is conducted on a global scale by committing to the readiness and stability of both our communities and clients, empowering them to make sound real estate decisions, rooted in clearly defined goals, season of life, and fiscal wellbeing.” Now that’s a worthy goal and one his clients appreciate! To learn more about Sam Cachola, email broker@realityrealtypros.com call 703 - 785 - 1158, or visit realityrealtypros.com www. 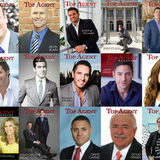 on being featured for Washington D.C. in Top Agent Magazine! “We are not a surprised Mr. Samuel Cachola’s team is being featured. Sam has put together an amazing team focused on purpose, professionalism, and customer service. “Caremenship™” is the blue print for how clients should be treated and how companies should train! The Heroes Media Group (HMG) family is honored and blessed to work with Sam and his team. Its been a a privilege to interview and air his vision nationwide. His is a great story, we are excited to help tell it, and get it in front of those who need to hear it! “Profit with a Purpose™” works! From everyone at Heroes Media Group, Congratulations! Your hard work, dedication and passion to serve is appreciated! Heroes Media Group is a podcast network and broadcasting platform dedicated to providing a voice for our community heroes and those who support them. HMG is dedicated to providing education, entertainment and empowerment to: Active Duty, Reserve, Veteran and Retired Military, Firefighters, First Responders, Law Enforcement, Educators, Medical Professionals and Clergy. Founded in 2015 To be the voice for all Community Heroes by bridging the gap between hero, citizen and the communities they protect, educate and empower. Learn how Heroes Media Group can help you grow your brand. Check out HeroesMediaGroup.com or call 202-656-7859 www. 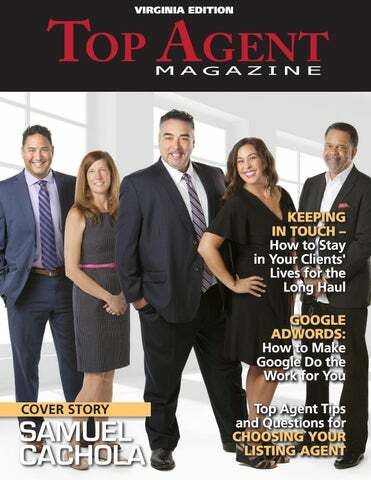 on being featured for the state of Virginia in Top Agent Magazine!